Here we present a brief account of the results of our research carried out on the Miocene rocks of Abu Dhabi's Western Region since 1979. It is mostly a non-scientific account and is illustrated by numerous pictures of the areas we have visited and some of the more spectacular fossils that we have discovered. Some of the early collections made partly by German archaeologists in the early 1980's are now housed in the Al Ain Museum but the main collection made by the NHM/Yale team of some 900 fossils is now curated by the Abu Dhabi Islands Archaeological Survey (ADIAS) for the Environment and Wildlife Development Agency (ERWDA) in Abu Dhabi. 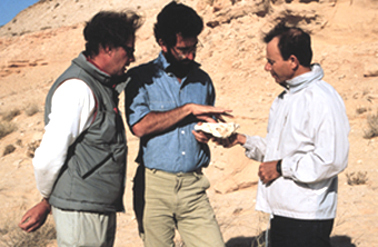 A full scientific account of the geology and palaeontology of the Miocene in the western part of the Emirate of Abu Dhabi was been published by Yale University Press in 1999 and titled Fossil Vertebrates of Arabia, edited by Peter J Whybrow and Andrew Hill (To read a review of this book click here).